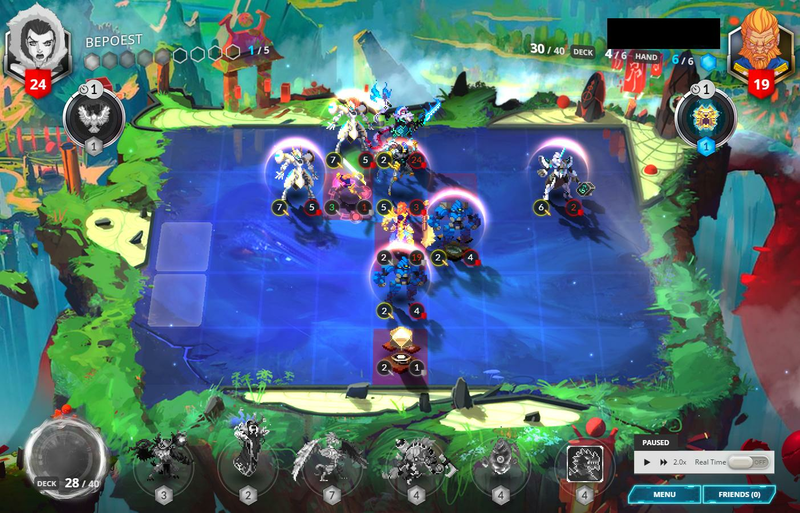 Here’s a silly combo deck, with enough shenanigans to keep everyone entertained for hours. Not sure about the competitiveness of this, but at my very low level of the ladder anything goes. Aspect of Ego with Jax Truesight, Malicious Wisp, Zurael! Flying robots with Aspect of the Wyrm! Floods and oodles of Forcefield! Absurd amounts of burst damage! It’s Faie Bloodwing’s Flying Circus! Deceptib0t should be the only Mech you pay mana for. Replace other Mechs and follow the alternate game plans until you find your Deceptib0t entry point. Alright I lied, I paid for the Chassis of Mechaz0r. But just because there was an existing setup. It seems fine enough but somewhat unfocused. After playing with him for a little, I feel that Zurael needs a pretty swarmy deck in order to not get completely screwed over by the RNG, and I don’t feel like this qualifies. Similarly, it looks like Razorback is extremely dependant on Jax, and Aspect of Ego will be inconsistent. Zohan posted a replay on Reddit recently of a deck built on similar lines in which you may be interested. On a side note, I miss the mech thread . I wasn’t paying close enough attention and it closed due to inaction. I guess there’s only so much you can do with just one minion type, but they are my favorite tribe and I enjoyed seeing the decklists. 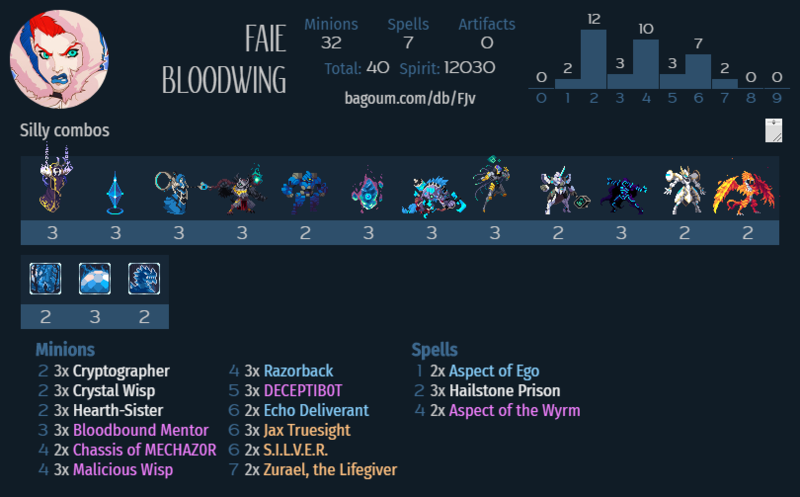 There’s a weird revival burst mech deck on discord right now, looks like this could be similar. Gonna work on both and hopefully I can get something back to you later. Just gonna add that shimzar + THorn/b0t is pretty cool. I also added well and luminous because they synergize well with Razorback. Game 2 was also a win. hmmm deceptibot/echo/silver on vanar huh? clever thing you have going with the zurael too. it summons more mechs than how many died right? A Spirit of the Wild and Ghost Seraphim variant is on my “testing todo” list, but I wanted to explore the Aspect of Ego territory first, and that came with Jax etc. Zurael should summon more Mechs if RNG agrees to, but I haven’t had the situation tested yet. @nh3maser, @cookedpoo thanks a lot for the reviews and pointers, I will check out these other decks. Update: the Spirit of the Wild version feels a bit slower and clunkier, probably requires a more profound rework. @nh3maser Here’s a refined version following your advice, also thanks to @cookedpoo for reminding me of Shim’Zar! It works beautifully! I agree that Zurael wasn’t so great in this deck. Huge robots back from Hell are of no use 50% of the time when they spawn half a mile away. I refocused on the Deceptib0t enablers, added Thunderhorn because it’s his best buddy and I was lacking a bit of AOE. Wailing Overdrive seems to be the most space-efficient booster to close games. Great synergy with Aspect of the Wyrm too. The lone Metaltooth is here for the high roll potential if I get my Mech army going. It’s also a low roll risk with Deceptib0t - if I draw it I keep it in hand, also remembering that he’s a fine Wailing Overdrive target. If you don’t like such variance, remove Metaltooth for another Aspect. In my last game I saw the nice reach this deck has as I was able to beat an active Strategos swarm. I really think that Faie bring a nice edge on this aspect. The lone Metaltooth is here for the high roll potential if I get my Mech army going. I will report if this doesn’t work as expected. AFAIK it’s not multi kill deceptib0t, so there shouldn’t be any issues. This list is nuts. I sent a friend request to Zohan in the game to hopefully get a chance to chat with him, about Mechs in general, and this list in particular which features so many strange things. I love watching his replays. If I have some time I will make a video because they are hilarious games. Metaltooth + Auroraboros + Echo is an amazing combo.